Ruth Livier, an ESL kid from a trailer park has become a Web Series Innovator and Webstar Pioneer. Ruth Livier is not just another alluring Hollywood beauty. She has substance, style, and is an in-demand working actress of stage, screen, and film. Ruth is probably best known for her starring role in the groundbreaking Showtime TV series Resurrection Blvd. and for breaking new artistic ground almost seven years ago when she created, wrote, and starred in Ylse, one of the very first made-for-the-Internet series. 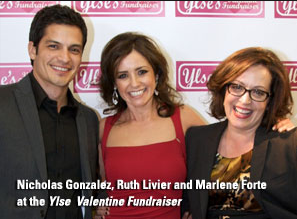 Ylse (Ylse.net) won many awards including the first IMAGEN award for Best Internet show. It also landed Ms. Livier on the cover of the WGA’s Written By magazine for becoming the first person to join that union via her work in new media. Ruth’s journey began in Guadalajara, Mexico.